It was, of course, lovely to see lots of my family and friends there: old people, young people, babes in arms. It was especially good to see those who will still be here after I am gone. Think about this. You never want this to stop. Would it be OK if after you were gone your great-great-grandchildren all lived short, miserable lives and died excruciating or terrifying deaths? Of course it wouldn't. Cllr. Read will be meeting with local Greens and members of the public at 8.15am (until 9.15) at Bedford Central Bus Station. They will be leafletting bus passengers, and engaging in conversation about the Green Party's plans to improve public transport services. The Greens are mounting a strong campaign to gain an MEP in Eastern Region where they have steadily increased their number of Councillors to currently stand at 27. There are now Green Party Principal Authority Councillors in every county in Eastern Region. "Bedford is a town that could benefit greatly from improved public transport infrastructure to ease traffic problems and give people more choices about the way they travel. One of my top priorities, if I get elected next June, will be to shift some of the E.U. 's transport budget from climate-dangerous international mega-projects to more local public transport schemes that benefit local communities." Question 1: What are your first impressions of the proposed design and do you have any suggestions for improvement? The plans look first class but in reality Rackheath could only be considered an eco-town WITHOUT the NDR. Transport within, to and from the community should be based around public transport and safe walking and cycling routes. Question 2: Do you have any thoughts on how residents and the current community could benefit from the proposals? Being part of an exciting new development and benefiting from clean air and top quality public transport. Question 3: What can be done to make the whole of Rackheath a low carbon community? There are numerous building techniques available to make existing housing stock low carbon and these should be used extensively. An easy quick move would be to provide insulation to all existing buildings. Wind and solar power power should also be harnessed where possible. Question 4: Please let us know if you have more thoughts, ideas or views on our proposals. Though I wholeheartedly agree with the concept of eco-towns I would have to question these proposals if they included the building of an NDR as that would wipe out any carbon saving gains for many years to come. Massive reduction in car journeys and good public transport provision has to be one of the key features of the plan. The Conservatives are in serious trouble -- their underlying deregulatory narrative has been totally blown out of the water by recent events. But that still leaves Labour in big trouble too -- for their underlying narrative was barely different. Brown was a high-priest of light-touch financial regulation: it is frankly sickening now to see him posturing as a saviour. ...It is deeply premature to think that there has been a death of New Labour. For Brown isn't doing enough to save us from financial and economic ruin. As I have argued repeatedly (see various posts below), this government's continued neo-liberal instincts are still hobbling it at almost every turn. Still, LIBOR is high; still, small businesses (and large ones!) are going to the wall without access to credit lines; still, the banks are being allowed to operate at arm's length... There is a pitiful failure of nerve in the government, a pitiful failure to grasp the historic opportunity here, which a Roosevelt would not fail to grasp. And that's only the government's failure on the financial and economic front. Its failure on the environmental front is far more reckless and complete. The pre-budget report recklessly promotes the trashing of our environment for uncertain short-term economic gain. This is an utter and heart-rending (when one thinks of those who will suffer from it) failure/absence of vision. We need the banks democratically controlled (or re-mutualised), (and) we need a Green New Deal. (http://www.greenparty.org.uk/membership/green-new-deal/index.html ) These are what the Green Party is calling for. By contrast, Labour's sad little offerings will not fundamentally change its fortunes -- still less, those of our civilisation, which, on current form and with current trajectory, is heading fast for the rocks, no matter whether Brown or Cameron 'pilots' our portion of it. As feared, ITV is to carry out major cuts in regional news across the UK, with mergers of outlets and over 400 jobs going. There will be 30 staff losses in news and politics at Anglia TV, including many well known presenters (1). Strong statements have been issued by current and past staff at Anglia and the local NUJ. Eastern Region Green Party shares those concerns. "ITV has been reducing its local news focus enormously since the Conservatives passed the 1990 Act, paving the way for deregulation of the industry and making ITV a business dependent on shareholder profit instead of a protected localised service and alternative to the BBC. And now ITV has announced a further downscaling. This is a regressive step and further jeopardises ITV's role as an important local news outlet. There is a greater, not lesser, need for regional media in today's 24 hour news world. Local news, like Anglia News, scrutinises local and regional politicians and political bodies and covers regional issues in a way that national organisations can't. People value their local news and often have a higher level of trust in local news output than they do with elements of the national media. Local news and current affairs coverage on Anglia should not be cut back. That is why I'm backing the NUJ's campaign against the ITV cuts and have signed the NUJ's petition to No.10 on this issue. (2)"
ITV has been warned that it was heading down a "dangerous road" by deciding to shed hundreds of regional journalists. The Green Party said ITV's intention to cut more than 400 editorial jobs from local news programmes was a "regressive step for the fourth estate". Rupert Read, Green Party Lead Euro candidate for the Eastern region, said ITV was becoming dependent on shareholder profit instead of providing local communities with an option to the BBC. "It is a dangerous road to be on," he said. "This is a dangerously regressive step for the fourth estate, and further jeopardises ITV's role as an important local news outlet. "There is a greater, not lesser, need for regional media in today's 24 hour news world. "Local news, like Anglia News, scrutinises local and regional politicians and political bodies and covers regional issues in a way that national organisations can't. "Anglia News is an absolutely invaluable part of the broadcasting world, here in the East - our public life would be much worse off without it or with the scaled down regional news provision that is proposed." I travelled recently (see pic in post a little below!) to Brussels at the invitation of Green Party MEPs Caroline Lucas, Leader of the England and Wales Green Party, and Jean Lambert, Green Party MEP for London. Along with lead candidates from the Greens' other target Regions and with my candidate from Eastern Region (Peter Lynn of Colchester), I toured the European Parliament, meeting key officials, and taking part in a conference on climate justice. The conference also featured Lord Stern, author of the influential Stern Review on the economics of climate change, and Pascal Lamy, Director General of the World Trade Organisation. The aim of the day was to prepare we Green candidates to take up office and become effective MEPs after next June's elections. We want to be ready to become MEPs and to be able to make a difference from day one following the election. With the electoral system being proportional, just 10% of the vote here in the East would be enough to get me elected to the European Parliament (see the post on the Tactical case for voting Green, below...).So, we have a great opportunity to add to the number of Green MEPs next June, especially here in Eastern Region where we are doing so well, and we want to make the most of that opportunity. Our current Green Party MEPs do a fantastic job and are amongst the most hard-working of all MEPs, as I clearly saw during my visit.We need more MEPs of that kind, who will relentlessly stand up for the right to a good quality of life - for both current and future generations, rather than pandering to big business and financial institutions. Honesty, energy and commitment is what voters will get if they vote Green next July. All we Green Party candidates of course travelled to Brussels by train. Last week, alongside Caroline Lucas MEP, our Party's recently-elected first-ever Leader, I helped launch the Green Party's European election campaign, and spoke with the nation's media about our plan for a 'Green New Deal' to get Britain and Europe out of the dreadful economic and environmental crisis that we have got ourselves into, as a society. Victories at the Euro-elections next June for the Green Party will make it more likely that this Green New Deal will happen. I want to be in Brussels, giving more power to Caroline's arm, helping make this historic and sorely-needed change really start to happen all across the E.U. I'm the lead candidate for Eastern Region, one of our two top target Regions (the other being NorthWest) for the Euro-elections. Now led me add to this a tactical consideration: the electoral system that the Euro-elections are fought under; the arithmetic. In particular, we have to look carefully at where the large UKIP vote in 2004 will go to. If their collapse to less than 2% in this year's London Assembly elections is anything to go by, the biggest chunk is set to return to a more Eurosceptic Tory party, but the BNP are actively courting disaffected UKIP activists and voters (to observe them in action look at democracy forum). If we look at Eastern Region first… Last time around, in June '04, the Tories won 3 seats, UKIP 2, Labour and the LibDems each 1. Even if they have a very good election UKIP are extremely likely to lose one of their two seats next June– they are short of money, completely internally-riven, bereft of Kilroy-Silk, and beset by corruption scandals. They will lose the seat in question either to the Tories (who might be able to advance to having 4 seats, if they have a very good election); or, conceivably, to the BNP (who claim to be targeting the Region); or to us. There is pretty much zero chance of Labour or the LibDems gaining a seat: can you really imagine either of those Parties gaining a substantial number (in the LibDems' case, several tens of thousands) of votes relative to what they got last time around? Are they more popular than they were in 2004?! So those are the options: either the Tories or just possibly the BNP gain in Eastern, or (just possibly) the UKIP holds onto one seat -- or the Greens make a gain. In the battle for that final seat, we are the only progressive option capable of stopping the right-wing candidate at next June's Euro-elections, here in Eastern. About 10% of the vote in Eastern would likely be enough to displace that second UKIP MEP with a Green, rather than a Tory (or a fascist). We already have 26 Councillors in this Region, and our vote in the local elections in Eastern Region is running at the 10% level – and that is under first past the post. The slightly larger North West region also deserves close scrutiny. In 2004 the BNP polled just over 6% and the Greens just under. The Kilroy-Silk surge propelled UKIP ahead of both, leading to a result where 3 Labour, 3 Tory, 2 Lib Dem and 1 UKIP members got elected. The region is now down to 8 seats like London: which means around 8 to 9% of the vote will be enough to gain the final seat. A 4th placed party gaining that share of the vote will certainly win a seat, but a 5th placed party finishing just behind them will be left out in the cold. When we talk about stark choices, they don't come much clearer than this. Assuming that UKIP lose their NW seat, a very small number of votes will likely make the difference between and fascist or a Green being elected, in NorthWest. Make no mistake that the North West region is the principal target for the BNP. Nick Griffin, their Chairman, is the lead candidate. His ambition for far right politics in the UK is modelled on the successful personality cults developed by Jean Marie Le Pen and Jorg Haider. His election as a Euro MP will give him the profile (and taxpayer-funded salary) he craves. We've seen Le Pen get to the second round of the French presidential elections and Haider force his way into Austrian government. There is no reason to assume that an organised and electorally-established BNP couldn't in due course do the same. The flip side for Griffin is that a failure to win a seat this time would almost certainly spell the end of his political career, if the recent internal discord and infighting in the BNP is anything to go by. The Greens have established a group on Liverpool City Council, recently gained 5 more councillors in Lancaster and have active parish and town councillors around the region. What we can expect that the BNP vote will grow sufficiently to put them into the "grey" area where they may or may not win a seat; as might we. The Euro-elections are 'traditionally' our best election: in 1989, we scored 15% nationwide; in 1999, we got our first two MEPs elected; in 2009, with Caroline Lucas MEP as our inaugural Party Leader, we are aiming to at least double our numbers of MEPs. To end where I began: Britain and Europe desperately need a 'Green New Deal', a 21st century version of what Roosevelt's Democrats gave the United States, the last time that there was a truly enormous stock market crash and banking crash. Now is the perfect time for a response - to the financial storm and to the underlying resource crunch (the age of cheap plentiful oil is coming to an end) and to the pollution crisis (climate chaos, the ultimate literal storm) - that will actually work. A Green response: a Green New Deal, creating hundreds of thousands of good green jobs, and stabilising our economy. And voters will have the perfect opportunity to vote for this, on June 4 of next year. You can play a significant role in preventing the rise of rabid anti-Europeanism and outright racism, in British and European politics, over the next 7 months. Those of you who would normally vote Labour or Lib Dem in London, the South East, the North West and Eastern region know that you will get at least one representative from your own party of choice in each of these Euro regions. So my appeal to you is to consider the wider implication, which is the direction UK politics takes over the next few years in a tough economic climate, well suited possibly to the growth of the far right. As little as 1 or 2% of the electorate switching from Labour or the Lib Dems to the Greens makes clear sense to me if it stops the BNP, and yes, we are being candid about this because the Greens will benefit electorally with a big enough tactical vote. Discussion on this topic needs to be frank and honest. I'd recommend that if you want to investigate further, look at the D'Hondt calculator, punch in the London Assembly results for a 7 or 8 seat region and see why even 0.1% matters. When you've finished doing the calculations, you might also want to read Raphael Behr's take on things. Prospective Green Party MEP for the Eastern Region, Councillor Rupert Read, will be speaking at the Green Fair to be held at The Corn Exchange in Bury St Edmunds on Saturday 22 November 2008. "These fairs certainly have something for everyone, from all age groups and backgrounds. There are a wide range of stalls ranging from energy saving devices to educational stalls from councils. At the Green Fair in Eye on 8 November, power saving devices were given away, as well as free reusable bags. There are art and craft stalls too and plenty of creative activities for children, both fun and educational. This is the green lifestyle in action: affordable, enjoyable, accessible to all." There will be live Folk and Jazz music at the event, with refreshments and meals available. The event is being arranged by Friends of the Earth in conjunction with the West Suffolk Green Party, and Rupert Read will be speaking about his hopes and aspirations for the people of the Eastern Region if elected to represent them in the European Parliament at the elections to be held on 4 June 2009. Doors at The Corn Exchange open at 10 am and the event will conclude at 4 pm. Admission to the event is by donation, whatever people can afford. On Sunday 16th November 2008 at 3.30pm, at Norwich Cathedral, there will be an ecumenical memorial service to honour too-many precious, unique, irreplaceable men, women and children killed in road crashes. World Day of Remembrance for Road Traffic Victims creates a link between victims of road crashes around the world, all of whom deserve to be alive today to fulfil their hopes and dreams instead of been killed, prematurely and violently. Norwich Green Party Councillors are proud to be part of this event – Councillors Read (Norwich Green Party Transport Spokesman) and Boswell (Green County Councillor) will be among those attending. As part of the act of remembrance, there will be a display board for photographs of loved ones who have been killed in road traffic crashes. There will also be an opportunity to write the name/s of those killed in road traffic crashes on an Oak Leaf card, which will be placed at the foot of the Easter Resurrection Candle. Said Cllr. Read, "I feel passionately about those needlessly and pointlessly killed in the annual car-nage on our roads. Initiatives such as speed-limit-reductions, safety cameras, pedestrian crossings, and better support for public transport are key parts of what will bring down this terrible toll, in years to come." "Light of Hope" initiative – A Transfer of the 'Light of Hope' from one continent to the other will take place by Video link. We are asked to have a light burning as a 'Light of Hope', either candle or electric, from 6pm to 8pm on Sunday Nov. 16th to remember road crash victims in the UK and Worldwide. World Day of Remembrance for Road Traffic Victims was initiated by RoadPeace in 1993. 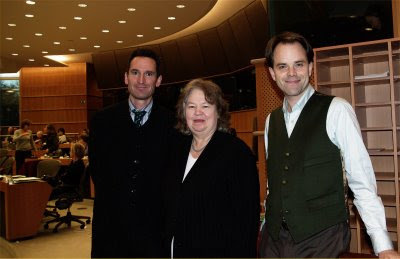 Here is me, Jean Lambert (Green MEP for London) and my no.2 on the list Peter Lynn, inside the European Parliament at a Green group meeting... It wasa good experience... Hopefully I'll be back! Click here to see a short youtube video made at the launch of the Green Party 2009 European Election Campaign on Monday. Your front-page headline (7 November) speaks of the banks being "ordered" to pass on the interest-rate cut to borrowers. But what does this really mean? Can a government that is avowedly running the banks that it now owns or part-owns on our behalf on a commercial and "arm's-length" basis "order" them to do anything? The Government's policy on the banks is incoherent. It is desperately trying to avoid calling what has happened by its true name: nationalisation. The Green Party believes that the banks that are owned or part-owned by the public ought to be controlled accordingly – "No taxation without representation". Our tax money has bailed out these institutions; the least that we should ask in return is for our needs and values directly to guide their lending policies. It is time that the Government started to take a serious role in controlling the banks it owns. It is absurd, and a grave danger to the prospects of stabilising our economy and avoiding a depression, to have banks hoarding money and refusing to lend. The banks ought not to be lending money lightly to bad credit risks – that, after all, is what got us into this trouble. But when they do lend, they ought to lend at low interest, to facilitate economic activity. It is way past time now for the Government to insist that the banks that it funds should do this. To work as a volunteer with Rupert Read (Lead Green MEP Candidate) and Simon Sedgwick-Jell (Campaign Manager) between now and June ‘09. Minimum Hours: Half a day per week or equivalent. The position would ideally be taken by someone living in or near Eastern Region, but we will also consider those living elsewhere in England. Job involves: Research and co-ordinating surveys etc in order to provide stronger real news than we usually have (not just opinion). Most of your quality time will be spent creating opportunities for the extra coverage that we need if we are to win a seat in the 2009 Euro Elections. If you think that you would like to take on this task then please get in touch (contact details below). Now that the Green Party has officially launched its European election campaign, your help could significantly extend Rupert Read’s ‘reach’ and that of the Green Euro-campaign, increasing the chances of us breaking through in Eastern Region, one of our two national target Regions. You would have the opportunity to gain valuable experience working closely with high-profile politicians, liaising with the media and being involved in a region-wide election campaign – great for the cv! Contact: rupertread@fastmail.co.uk or call Simon Sedgwick-Jell on 01223 474557 or 07961 695882.
should come down - the Government should make it so. that, after all, is what got us into this trouble in the first place. I'm giving my full backing to the NUJ's campaign to stand up for ITV's local and regional news services (1); the proposed sweeping job cuts and local service mergers are a regressive step for the fourth estate and a dangerous road to be on. ITV has announced it will cut 429 of its editorial staff from its local and regional news programmes across the country - in the process merging newsrooms and creating enormous 'mega-regions'. ITV has been reducing its invaluable localised focus enormously since the Conservatives passed the 1990 Act, paving the way for deregulation of the industry and making ITV a business dependent on shareholder profit instead of a protected localised service and alternative to the BBC. It is a dangerous road to be on. And now ITV has announced a further downscaling of local input and planning. This is a dangerously regressive step for the fourth estate, and further jeopardises ITV's role as an important local news outlet. There is a greater, not lesser, need for regional media in today's 24 hour news world. Local news, like Anglia News, scrutinises local and regional politicians and political bodies and covers regional issues in a way that national organisations can't. Anglia News is an absolutely invaluable part of the broadcasting world, here in the East -- our public life would be much worse off without it or with the scaled down regional news provision that is proposed. Students from four universities and members of various political factions joined forces to protest against tuition fees. The demonstration - made up of students from Cambridge University, the University of East Anglia (UEA), Anglia Ruskin, and Sussex University - was part of the East Anglia Day of Action. About 150 protesters carried bunches of red balloons and home-made cardboard placards with slogans demanding that the government 'Make Tuition Fees History' and that they 'Bail Out the Students, Not the Bankers'. Many wore home-printed red t-shirts reading 'broke and broken'. The demonstration began on Christ's Pieces with a speech by NUS Vice President for education, Aaron Porter. He told the crowd: "We are faced with a massive problem in the UK; the 2006 introduction of variable fees was an absolute disaster. We need to stand up to the Government and say no to the marketisation of Higher Education." David Howarth, MP for Cambridge also expressed his sympathy for the students' cause: "I fully endorse everything you're saying, everything you're doing today. We need to say no to lifting the cap [on top-up fees] - the principle of free education is worth fighting for no matter how long it takes." Accompanied by a small police presence the students were kept under the watchful gaze of two top-hatted University Constables and two proctors in mortarboards and gowns. The protesters made their way down to Market Square before marching along King's Parade and Silver Street to their next gathering point, Queens' Backs. Led by a man on stilts, a girl with a ukulele, and a giant red papier mach� pound sign (courtesy of "the collective genius of the East Anglian Masses" - that is, UEA students), the march progressed noisily but peacefully. The only time the police had to step in was to persuade the protesters to stay on the pavement. Some of their chants included 'Students unite, education is our right' and 'They say cut back; we say fight back'. A representative from the National Union of Teachers (NUT) said: "Every one of the members of the current cabinet benefited from free education. How dare they pull up that ladder behind them?" Banners revealed the presence of numerous political groups, including the UEA Socialists, members of Education Not For Sale, the Workers' Revolutionary Party, the Socialist Workers' Party and Socialist Students, as well as the Union of UEA students and the Cambridgeshire NUT. Onlookers also pointed out "at least two Norwich anarchists" and "a member of the Trotskyist wing of the Liberal Democrats". Although the CUSU banner was carried on the march, CUSU Higher Education Funding Officer, Emily Hammerton Berry, was conspicuously absent. She defended her absence to TCS, saying: "I came along to the rally at the end but I couldn't make the march; I had two supervisions, one of which I couldn't reschedule." She insisted that she remains committed to the cause of free education, saying: "I really wanted to be there. I've been building for this as much as anyone. I attended all the planning meetings and went to the gathering afterwards to help organise future demos and keep the momentum going." On Queens' Backs, Rupert Read, Green Party councillor for Norwich, told The Cambridge Student (TCS): "The question boils down to: do we want our children to go to university and be saddled with mountains of debts? The old system was basically fine - why can't we have education like healthcare, free to all? If we increased taxes on the very rich a bit and stopped paying for stupid things like nuclear missiles and I.D. cards we'd easily have the money." The first speaker on the Backs, Socialist Students' Edd Mustill, said: "Working class students are being excluded from university. At home I know mates who aren't c considering going to university because they can't afford it. This is real life; students are being priced out of Higher Education and no amount of bursaries can fix this." He added: "This government doesn't believe in free education. For them, education is a commodity and we are customers. For us, it's a right to be enjoyed equally by all regardless of background." National Secretary of Education Not For Sale, Edward Maltby said: "Students are under attack. The Government is trying to shift the economic burden of the crisis onto the shoulders of students." Speaking to TCS afterwards, he added: "The money for free education certainly exists if the Government can spend £76bn on renewing the nuclear weapons system and bail out banks by buying their losses. The top rate of income tax and corporation tax is the lowest in living memory. There is no reason why we can't raise the money to fund all public services decently and fund free education." Norwich Councillor Rupert Read, prospective Green Party MEP for Eastern Region, has today pledged that, if elected to the EU Parliament next summer, he will support War On Want's 'Rough Trade' campaign to stop the European Union exploiting developing countries around the world. War On Want is fighting to end the EU's unfair and aggressive trade tactics that help perpetuate poverty for hundreds of millions of people worldwide. Cllr. Read will also be speaking from the floor in favour of Fair Trade at a debate this Friday 7th November at the UEA in Norwich. UEA Conservatives are holding a debate titled 'Free Trade Vs Fair Trade, which will solve poverty in the third world?' This will be held in the Union House from 5.30 pm. Speaking from the platform against Fair Trade and for 'Free Trade' is Sir Teddy Taylor (former Conservative MP for Southend). Speaking for Fair Trade is Stephen Roberson (Fair Trade retailer, wholesaler, importer). "With developing countries refusing to sign up to the World Trade Organisation's neo-liberal agenda that would see their future unfairly sold off for the profit of European businesses, the EU is now bypassing multilateral trade talks and instead is bullying poor countries and regions into trading with it directly. "The EU wants to open up new markets and services in the developing world with a privatisation agenda on poorer countries' public services, which would see money pouring out of these countries - money that could be better used by the developing countries for national healthcare, clean water provision or education. "Green councillors in Eastern Region and up and down the country are committed to keeping public services out of the hands of private companies. "If elected next June as a Green Party MEP for the East, I will continue to fight against unfair EU trade deals that threaten public services, and continue to support Fair Trade". I will be speaking to a large gathering of schoolchildren at the Norwich (Goat Lane) Quaker Meeting House tomorrow morning (Fri 7., starting 10 a.m.) about working for peace in Norwich and about what first drew me to peace work. I'm looking forward to it! As you (as a reader of Rupert's read) probably know, the new Planning Bill is very bad news for taking away the rights of objecting to new nuclear proposals and such major projects as incinerators or airports, and needs to be amended. The new Planning Bill is about to become law, and will remove the right of communities to have a meaningful right to be heard. This will result in a system that is undemocratic, and which makes it very hard for you to get involved in planning decisions about big projects like roads, airports and nuclear power stations being built where you live. What is needed now is a mass movement to keep Obama from being as dodgy as he has been much of the time since the Primaries ended. Take foreign policy: Outflanking Bush on Afghanistan is a pretty worrying sign. Never forget the very dangerous thing about Democrats: they generally spend ages (and money and lives) trying to prove their virility. Biden is a likely case in point. Having said all that: if I were in a swing state today I would definitely have voted for Obama. McKinney [the Green candidate] has performed poorly in the campaign. : she has disappointed. There is some chance that tonight is a new start, and not merely a false dawn. The hope that has been generated by Obama's extraodinary and mostly very clever campaign might yet be its own salvation: if it can be leveraged into a movement that stops Obama from selling out more than he already has, and maybe even pull him back some. Cllr. Dr. Rupert Read, 2009 Green Party prospective MEP for the East, is lending his support to students from Cambridge, Norwich and across the Region protesting against the £100 million cut in student grants, announced by the Universities Secretary John Denham (1) last week. The cuts will affect thousands of students from middle-income families in the East. Cllr. Read described the cuts as 'penny-pinching our students' futures', and instead called for the return of free, universal higher education. On Wednesday, November 5th students from the University where Dr. Read teaches, the University of East Anglia (Norwich) will be joining students from  all over East Anglia to demonstrate in Cambridge over this important issue that affects the wallets of many families here. Dr. Read played a leading role in the (just-unsuccessful) campaign to stop top-up fees being introduced under Charles Clarke, then Education Secretary. Dr. Read will be travelling tomorrow with students from UEA by coach and has been invited to speak at the rally in Cambridge. "The Green Party have long campaigned hard against the Government's gradual privatisation of higher and further education funding provision. We will continue to do so until higher education is treated as a human right and not as a privilege to be bought by the wealthiest at the expense of the poorest. Just as children of all parents should get medical treatment on the NHS, so children of all parents shouldn't be charged to continue education past 16. "Higher and further education is central to the social mobility of a society. The Government makes great claims about giving people the opportunity to better themselves, but by introducing and retaining fees and abolishing student grants it has potentially put some of the brightest off, just because they can't afford to reach 21 and be saddled with thousands of pounds of debt. "Is it any wonder that a recent Organisation for Economic Co-operation and Development (OECD) report on Britain's stiflingly low levels of social mobility led to stinging criticism (2). The report stated that 'what your parents earned when you were a child has much more effect on your own earnings than in more mobile countries'; a damning verdict on our Government's insistence on charging for education. "The Government is penny-pinching our children's futures." RR's talk on 'Green Politics and Green Philosophy', 16 Oct. 08 - Enjoy! 1. 2. 3. Rupert's Read: November 2008 4. 12. 15. 18. 19.